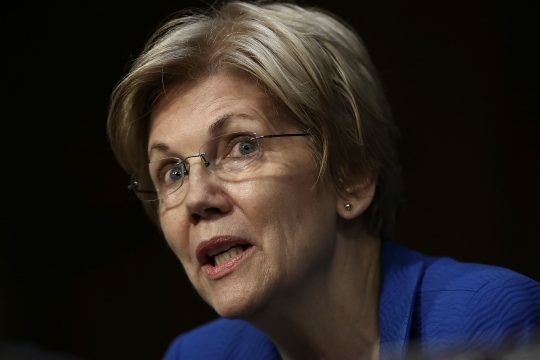 In August, Warren lambasted the criminal justice system as racist "from front to back" during a question and answer session hosted by Rep. Cedric Richmond (D., La.) at Dillard University in New Orleans. "The hard truth about our criminal justice system, it’s racist," Warren said. "And when I say our system, I mean all the way. I mean front to back…on the front end—what you declare to be illegal—[and] on how you enforce it, on who gets arrested." The senator's comments triggered widespread condemnation from town hall attendees, elected officials, and police officers, alike. Her remarks even elicited a rare censure from Attorney General Jeff Sessions, the country's top law enforcement official who has made restoring "officer morale" a top priority of the Trump Justice Department. Citing the fact that too many political leaders took law enforcement officers for granted, Sessions castigated Warren's "slur" as not just "wrong" but "sad" as well. "Earlier this week, a U.S. Senator called our justice system ‘racist,'" Sessions said at the time. "This is a slander of every law officer and every prosecutor in America. And, frankly, I think it is an insult to their families and to the crime victims they have helped to face their attacker." Warren's remarks surrounding race and the criminal justice system also come amid an uptick in the level of violence perpetrated against police officers. As denoted by the National Law Enforcement Officers Memorial Fund, the number of federal, state, and local law enforcement personnel that perished in the line of duty throughout the first six months of 2018 was 12 percent higher than the number on record for the same period in the preceding year. In accepting the union's endorsement, Diehl expressed that law enforcement needed a strong voice in Congress to ensure they have the adequate resources required to tackle crime and preserve public safety. "They need a senator who will have their back not throw them under the bus to score political points. Warren calls them racists," Diehl said. "I call them heroes." This entry was posted in Issues and tagged 2018 Election, Democratic Party, Elizabeth Warren, Massachusetts, Police. Bookmark the permalink.